Deanna Ebner, center, wife of Lucas Manteca and co-owner of the Taco Shop, chats with happy customers. Shrimp, brisket and chorizo tacos, street corn, lamb rice bowl, house-made hot sauce, with Jarritos grapefruit soda and watermelon lemonade, below, are some of the authentic menu items. Shrimp, brisket and chorizo tacos, street corn, lamb rice bowl, house-made hot sauce, with Jarritos grapefruit soda and watermelon lemonade. The tacos are, fittingly, the standouts at The Taco Shop, with varieties like shrimp, brisket and chorizo, below. Is there anything Lucas Manteca can’t do well in the kitchen? The chef, who dazzles diners regularly at Quahog’s Seafood Shack in Stone Harbor, the Red Store — an eclectic general store, coffee shop and restaurant — and his Little Store bakery and market, both in Cape May, is at it again. This time, wowing the masses with the simple goodness of authentic tacos at The Taco Shop. The Taco Shop actually has two locations, which was news to us. The James Beard Award nominee has been promoting its second location at Cape May Airport, but we never knew the original opened its doors nearly 10 years ago as an extension of Quahog’s. We took the motorcycle out on a nice spring Sunday to the airport location, which is adjacent to Cape May Brewing Co., and if the original is anywhere close to as good as the new location, it saddens us that we’ve been missing out on tacos this good for so long. Simply put, Manteca’s tacos are the best tacos in South Jersey. Hands down. No one close. Case closed. Don’t even argue. That is particularly the case when it comes to the CM Brewery Barbacoa de Becerro (lamb) and the De Puerco Al Pastor (pork shoulder). Like all of the meats, the lamb and pork are slow roasted overnight for about 12 hours and, of the two, the lamb reigns supreme in absolute goodness. The lamb is braised in a stunning sauce, which includes a Cape May Brewery brew, and then placed on a homemade corn tortilla — lightly grilled, of course — before being topped with pickled carrots and Salsa Borracha. Nearly as good was the pork taco with pineapple and caramelized onions. Tender, juicy, perfect. Manteca, of Argentinean heritage, and his business partner Maria Fox, of Pickle Girl Pickles, are using the best ingredients to ensure their motto of “Healthy + Delicious + True Mexican” equals a taco-eating experience that is second-to-none. It’s casual all the way. Peruse the chalkboard at the front of the store for specials — including Sunday’s fish ceviche taco — as well as the large wall menu to figure out what you want, order at the counter, then grab a seat at the taco bar, inside the small dining room or on the outside patio. The dining room walls are a simple gray with paintings of roses and the Taco Shop logo. Bring your own beer or wine, or stop by Cape May Brewing next door for some libations. But you can also order Mexican Coca-Cola, Jarritos sodas or three homemade flavored waters ($4). We particularly enjoyed the Agua Pina flavored with pineapple, cucumber, lime and honey. The biggest disappointment of the day came on the “Snacks” side of the menu. Although the guacamole, offered traditionally ($6) with queso ($6) or crab ($8), is absolutely outstanding, thanks to its freshness and quality ingredients, the accompanying tortilla chips were not homemade. No doubt they are quality corn chips, but the absence of a fryer inside the Taco Shop makes it impossible for the Taco Shop to make its own chips. Although they were fine, it’s almost a necessity to have homemade tortilla chips at a Taco Shop, especially one this good. Our disappointment faded quickly after biting into the Mexican street corn ($4) with chipotle mayo, crema, El Muerto salt, queso fresco, lime and cilantro. Although Jersey corn is not in season, the corn was crisp, and the blend of ingredients and seasonings were as close to perfection as you could find. Now back to the tacos. Diners can mix and match them any way they please. And although we cannot stress enough to get the lamb and pork, you will not regret choosing any of the seven fixings, including De Pollo, chicken with mole poblano, pickled red onion and queso fresco; De Chorizo Casero, homemade Mexican sausage with salsa roja and Xni Pec sauce; De Carne Asada, short ribs with cherry tomato, avocado, pickled red onion and creamy chimichurri; De Camaron, shrimp with sofrito, refried beans and salsa roja; and the Vegeteriano, vegetable tacos with corn, mushrooms, pickled carrots, queso fresco, radish and cilantro. You can have any of those choices inside a burro ($8), quesadilla ($7) or rice bowl ($9), and we chose the latter with chorizo. The bowl was nearly as good as the tacos, with all of the ingredients compartmentalized nicely: rice and beans, queso fresco, corn, guacamole, pico de gallo, crema, cilantro, radish and the chorizo. Customize each bite just the way you want it. Our only gripe was the homemade chorizo didn’t have enough kick for us. We rarely order desserts at Mexican restaurants, but we were pushed into ordering the Quatro Leches ($6), a four-milk cake with a side of milk for dipping. Topped with a caramel icing, we devoured every bit of it and would come back just for this. Outstanding, which is no surprise to those who know it’s made by Michel Gra, the French Master Baker and manager of Manteca’s Little Store. Don’t leave without some of Fox’s amazing pickles or one of two homemade hot sauces available for takeout for $9. Both are so good they should be sold en masse. The green Chimi Chimi is the superior of the two, thanks to its perfectly pureed consistency featuring tomatillos and jalapenos. But the red sauce — Holy Camole — is nearly as good and offers a little more heat. 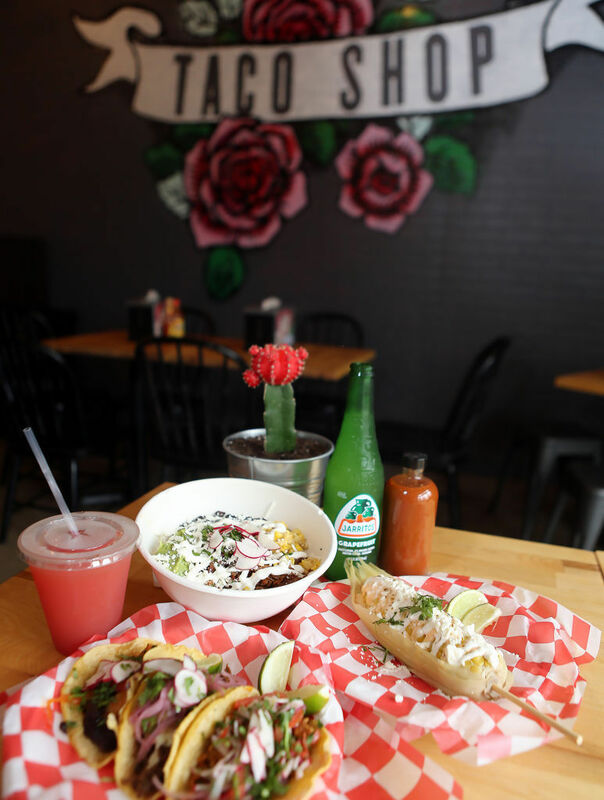 The Taco Shop is a hidden gem worth seeking out. Priced right, authentic, fresh, creative, casual with great attention to detail, The Taco Shop proves once again why Manteca is considered one of Cape May County’s best chefs. How much: Tacos range in price from two for $7 to three for $9; burros $8; quesadilla $7; rice bowl $9; leaf bowl $9; snacks $4 to $8; desserts $3 to $6. Services: Major credit cards accepted. No liquor license. BYO. Disabled access through front door. Eat in. Takeout. Private parties. Catering. Outdoor patio. No kids menu. No smoking. More info: For airport location, call 609-849-9045; takeout 609-600-2961. For Stone Harbor call 609-368-6300 or go to TacoShopTacos.com. Between you and me: Coming soon, you will see some Taco Shop merchandise, including a T-shirt playing off of ’70s cars and disco themes. One of them will have fuzzy dice hanging from the logo, which the owners coincidentally discovered that pilots also hung from their cockpits for good luck. Sounds just about perfect since they are located in a former World War II airport.